We all know the benefits of being physically fit and we all know we should work out! Whether you prefer to workout alone or in with a group, lift weights or run on a treadmill, Falling Springs has something for you! Click the buttons below to see our rules, what equipment we offer, fitness class information and much more! Selectorized weights are weight machines that have one or more weight stacks (rectangular weight plates that are attached to the frame and utilize a system of pulleys). Users isert a pin into the desired weight point and all the weights above the inserted pin will be lifted. Adjusting weights on a selectorized machine is extremely simple and only takes a matter of seconds. That’s why we have HUGE range of Group Fitness classes, meaning you’re sure to find something you love, which is possibly the biggest key to sticking with any fitness routine! Whether it’s TRX, Barre, Core de Force, Group Cycling, Yoga, Bootcamp or Zumba, we have something that you’re sure to love! And those are just a few of the classes we offer! Click the link on the sidebar to the left or at the bottom of the page for a schedule of classes and descriptions. ALL classes are included with memberships, visit cards and paid daily admission, but classes are limited in size. Be sure to get here early to get a spot! 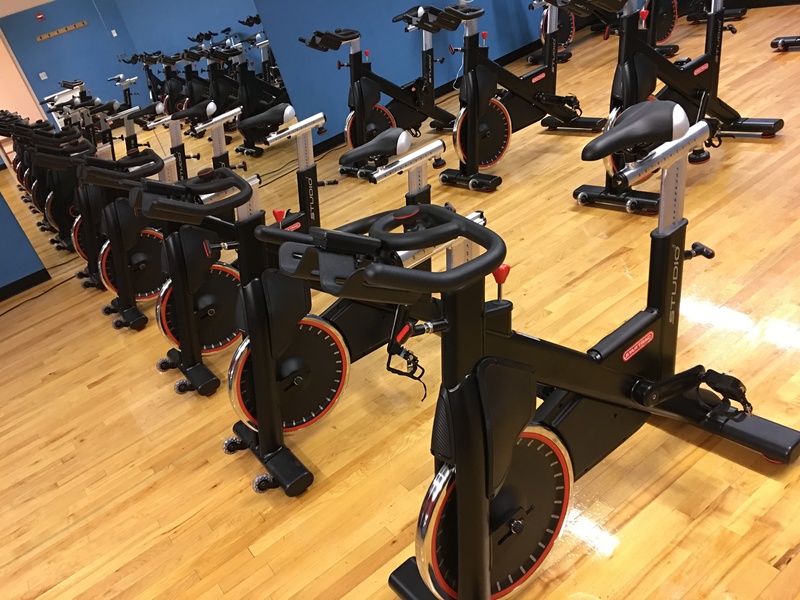 Our group cycling classes are held in the spin room, located upstairs above the fitness room. Room is accessible by stairs and by an elevator. Includes 18 StarTrac bikes and access to hand-weights and mats for cross-cycling workouts. 6 classes cycling related classes are offered each week. When a class isn’t using the bikes, they are open to to fitness room users too! Ever wondered about hiring a Personal Trainer? Is it worth the cost? There are are actually a lot of reasons why working with a Personal Trainer can be beneficial as you work to reach your fitness or weight loss goals. Regardless of your age or experience level, a trainer can help you see better, faster results and help you live a healthier lifestyle. A personal trainer can create a workout plan that will ensure you are spending time on the proper types of exercises based on your goals. If you only have a limited amount of time to work out, a personal trainer will make sure you get the best results possible for the amount of time that you put it. Most people have multiple goals when working out, the most common being fat loss and muscle gain. A personal trainer can help you find the right exercises balance these goals so you can achieve them! This one cannot be overstated! Too many people think they know the proper way to perform an exercise or skill but in truth they have poor form and technique, which is a recipe for a fitness disaster. A personal trainer will teach you the proper form and technique so you can stay safe and injury-free. Trainers are able to help you find ways to make exercise fun and enjoyable. If you see the benefits and you enjoy it, you’re more likely stick with it, leading to a lifetime of health and fitness. They can help you overcome obstacles that might prevent you from exercising, and help you set many small, achievable goals. When you hit a plateau in your exercise routine, it can be frustrating to stay motivated. A personal trainer can help you avoid plateaus and if you do hit one, help you find ways to break through it and continue to see results. Falling Springs has several amazing Personal Trainers who can help you reach your goals! To start the process of scheduling and paying for personal training sessions, please click Personal Trainer Request Form for a printable form or click HERE to complete the form online. Or contact Fitness Manager Tefany Bleuel with questions! Click here for a Personal Training Brochure. Have you been training with a Falling Springs Personal Trainer and just want to add visits? You can do so during business hours by calling the office at 859.873.5948 or you can do so online HERE. – 14 & 15 year olds must have a Parental Waiver on file before using the fitness facilities and a parent supervision is required. – Return equipment to it’s proper place when you are finished using it. – Disinfect equipment after use. Spray bottles and towels are located multiple locations in the fitness rooms. – Do not take equipment from the fitness room.